Navigate: StoreFront / Patterns / Piecemakers Original Patterns / Frozen Freddy and the Flashy Frosties NEW! Frozen Freddy and the Flashy Frosties will be the stars of the show this holiday season! From a small and sweet "Frosty" to the large, eye-catching leader of the pack, "Frozen Freddy", these silly, chilly characters can fit in every nook and cranny of your home. Add the whole crew of flashy, frozen fellas to your holiday decorations this year for an extra festive touch of fun! 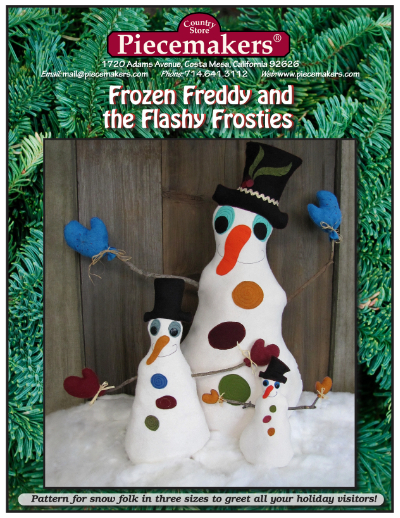 Frozen Freddy and the Flashy Frosties are delightful easy-to-construct snow dolls in three sizes – approx. 11.5", 19.5" and 36" tall.